The seasons of the church year form a framework and rhythm by which Christians can live their lives. The seasons are enhanced by scripture readings, worship and rituals. For special services for each season please click here. Advent, which means coming, is the beginning of the liturgical church year. This season is a four week period of anticipation and preparation during which we ready our hearts, minds and homes to celebrate the birth of the Christ child. The first Sunday of Advent falls on the fourth Sunday before December 25th. 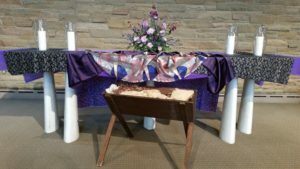 The liturgical color of the season has historically been purple; however, in the recent past some churches and denominations have begun using blue symbolizing royalty and hope. The color for the third Sunday is pink symbolizing joy. Advent wreaths and litanies help to ritualize the four Sundays. The wreaths originated in Germany within the Lutheran tradition around 1833. The tradition spread throughout Germany to Austria, Switzerland and then in the late 19th century to Pennsylvania and Ohio. Each Sunday successive candles around the wreath are lighted. A fifth – the white Christ candle located in the middle of the wreath – is lighted on Christmas Eve. Click here for resources for family, youth and adults. The 25th of December is the annual holy day that commemorates and celebrates the birth of Jesus. The term originated as early as 1123AD in Old English at “Christes masse” followed by Christmas in 1568. The actual date of Christ’s birth is not known; many scholars suggest the Christ child was born in the spring. In 354CE, the early church chose the date of December 25 as it coincided with the winter solstice. This gave rich symbolism to Jesus coming as light into a darkened world. The liturgical color for Christmas Day is white. The Christmas season lasts for 12 days – until January 6. The word Epiphany comes from the Greek word epiphaneia which means manifestation or appearance. The festival of Epiphany is celebrated on January 6 – the twelfth day after Christmas. Epiphany dates back to the 4th century and celebrates the arrival of the Magi with their gifts for the Christ child. Epiphany is often called “little Christmas” as it recalls the disclosure of Christ to all people. In the Hebrew scriptures, God seemed mainly concerned with the Hebrew people; in Christ we see that God’s love is for all people throughout the world. The liturgical color for Epiphany and the following Sunday is white; for the remaining Sundays in the season the color is green. Lent is a forty-day period beginning on Ash Wednesday and ending on Holy Saturday, (not counting Sundays) during which we remember the birth, life, ministry and death of Jesus the Christ and prepare to celebrate his resurrection on Easter Sunday. Lent is a season that invites us into a more reflective mode. 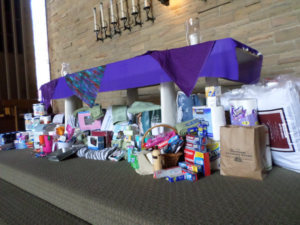 Prayer, fasting and almsgiving are three spiritual disciplines typically associa ted with Lent. Prayer is a biblical as well as spiritual practice and is conversation with God. Fasting for many people means giving up something while others choose to take something on. Acts of almsgiving are meant to encourage compassion and charity in our daily lives and strive to alleviate the suffering of others. Holy Week begins with Palm Sunday when we remember Jesus’ triumphant entrance into Jerusalem. On Maundy Thursday we remember the final meal Jesus shared with his disciples. On Good Friday we remember Jesus’ death upon the cross. The liturgical color associated with Lent is purple symbolizing penitence. Celebration and joy replace the solemn atmosphere of Lent as Christians celebrate Jesus’ resurrection on Easter Sunday morning. Easter is the most important day in Christian year as the resurrection is the focal point of our faith. The season of Easter is fifty days long. Colors for this festive season are white or gold. The symbols of an empty tomb, empty cross, butterflies and eggs symbolize Christ’s victory over death. Pentecost celebrates the presence of the Holy Spirit and the birthday of the Christian Church. The color for Pentecost Sunday is red changing to green for the season after Pentecost which generally spans half the year until Advent. During the season after Pentecost we remember God’s presence with us in the breathing in and out of everyday and in everything.